Information: Cynthia Weiss and Mirtes Zwierzynski formulated and led this project to enable refugees from Guatemala to present their cause in public spaces and inform the public at large about the political situation in Guatemala. Beginning with the rich cultural heritage of participants and their struggle for justice and social and racial equality, the group decided to work in the form of a trilogy in which life, death, and hope would be the main subjects. Participants talked about their experiences and shared texts by Guatemalan writers describing or evoking the struggle for democracy. Design exercises began to develop the material the artists would use to create the compositions. 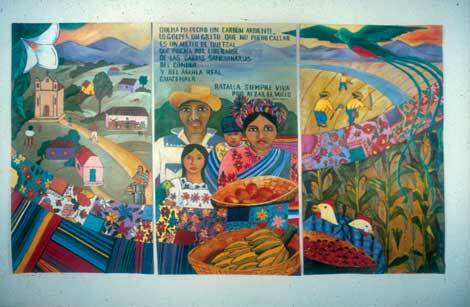 The first mural, a set of three panels, depicts indigenous Guatemalan rural life including a Guatemalan family and the Guatemalan national bird, the Quetzel. The second set of murals reveals the hardships that have existed in Guatemala’s past and that still exist in the present. The final panel illustrates hope for the future of Guatemala.